Ireland’s first National Bike Week starts tomorrow (14-21 June), which not only gives us the excuse to dig our bikes out from the back of the shed, but also to see where we can enjoy riding them. At last, the wheels of change are in motion for Irish cyclists, as National Bike Week is part of a new National Cycle Policy Framework, the aim of which is to get as many of us as possible back in the saddle again. For details of this week’s events see http://bikeweek.ie. I am using National Bike Week to celebrate Ireland’s first long-distance trail, The Kingfisher Cycle Trail, a must for anyone who wants to discover the hidden gems of the North-West. The Kingfisher is an appropriate name for it – this elusive little bird is associated with lakelands, and the 370kms trail twists in an out of the extraordinarily endless lakes of Cavan, Fermanagh, Leitrim and Monaghan, giving the Kingfisher (and us) a superb choice of shores to rest upon. The Trail is designed as a figure of eight, divided into two loops. The northern loop circles Lower Lough Erne, then moves alongside Loughs Melvin and Macnean, stretching out as far as Ballyshannon in Co. Donegal. The lower loop is bordered on two sides by Upper Lough Erne and Lough Allen. A good starting point for the southern loop is Carrick-on-Shannon, from where you can travel east, along backroads through the patchwork quilt-like landscape of tiny lakes. On this route, an ideal picnic stop is at Newtownbutler where, if travelling anti-clockwise, you have to phone the ferryman to help you back on your journey across the lake to Crom in Co. Fermanagh. For the northern loop section, hire bikes at eco-friendly, family-run Corralea Activity Centre (www.activityireland.com), or base yourself here for a few days. Then go further north, and check out the extra Atlantic mini-loop from Belleek or Ballyshannon to the sandy beach at Rossnowlagh. Creevy Cottages, overlooking the sea, are the perfect stop-off for this bit (www.creevyexperience.com). The Kingfisher Trail’s map is excellent (€6, www.cycletoursireland.com), offering several different ways to break up the Trail, as well as day routes and attractions along the way. It also points out some of the busier sections of road, warning cyclists to take caution, but there are few of these. 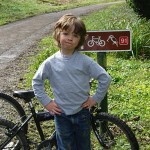 Other fine eco-friendly places to stay along the Trail, which either offer bikes free of charge to guests, or arrange bike hire, include The Old Schoolhouse, Meenaslieve, County Cavan (www.theoldschoolhousecavan.com), or tie your bike up beside the tipi at Orchard Acre Farm (www.orchardacrefarm.com). Two lakeshore accommodations which offer bikes and a boat free of charge are Little Crom Cottages on the shores of Upper Lough Erne (www.littlecromcottages.com), and Trinity Island Lodge, at a beautiful island hideaway near Killeshandra, County Cavan (www.trinityisland.com). You can have a superb massage after a day’s cycling if you stay at the Blaney Spa and Yoga Centre overlooking Lough Erne (www.blaneyspaandyogacentre.com), and you can reward yourself with some of Donegal’s finest fare at Ard Na Breatha, which won Georgina Campbell’s Best Guesthouse this year (www.ardnabreatha.com). The new Cycling Framework also aims to integrate cycling into the public transport network, and not before time. At present, there are only certain rail routes which cater for bikes, and for details of these see www.irishrail.ie. If you want to leave the car at home, you can also think about taking the bus, as both Bus Eireann and Ulsterbus will take bikes in the boot, if there is room, on a first come first served basis. For some more excellent cycling options abroad, check in with me in a couple of weeks time. This entry was posted in Articles and tagged cycling, ecotourism, Fermanagh, green travel, Ireland, Kingfisher Cycle Trail, responsible tourism. Bookmark the permalink.